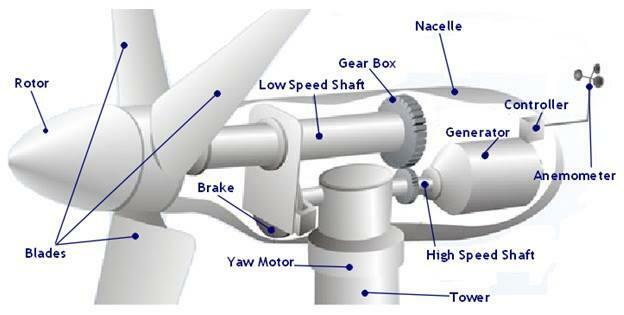 This is the fourth article in the Wind Energy Course (WEC) series on Basics of Wind Power Plants. 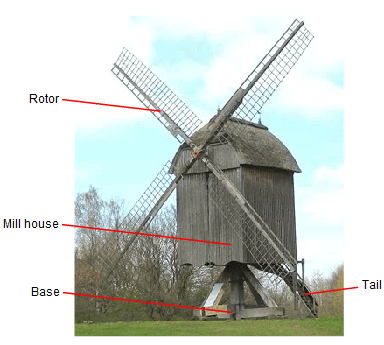 This article discusses wind conditions for the conversion of wind to electric energy. 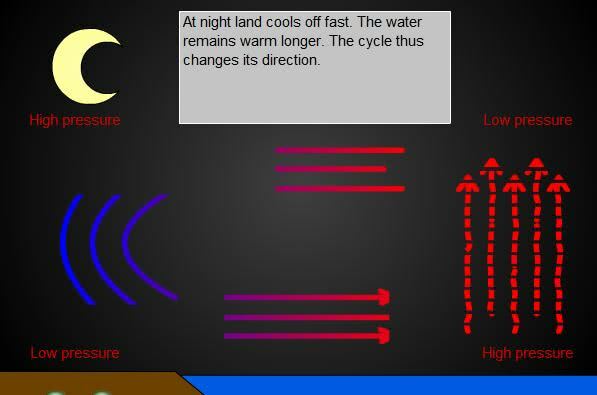 Various wind conditions and characteristics are described in detail. A wind power plant converts the kinetic energy of air currents (wind) into electrical energy. Efficient operation is achieved at wind speeds which are neither too low nor too high. Operators of wind power plants seek locations which offer the best possible wind conditions for their plants. What are typical wind speeds? These and other questions are answered in this post. Ultimately wind is essentially attributable to solar energy. Variations in temperature at the earth’s surface result in correspondingly different regions of low and high pressure in the atmosphere. The differences in pressure are compensated by flows of air – or wind – from high-pressure to low-pressure regions. Large-scale air currents and planetary circulation (e.g. trade and monsoon winds) are influenced by the earth’s rotation and land-sea distributions. Local winds are influenced by terrain roughness. Buildings, too, influence air flow by way of turbulences arising on the buildings’ leeward sides. 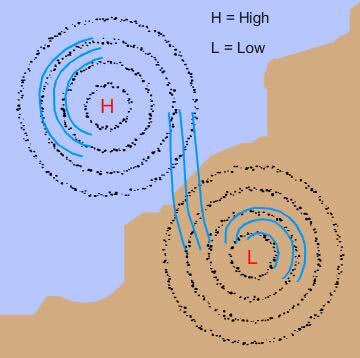 Air flowing from high-pressure to low-pressure zones tends to generate strong vertical turbulences which result in regular gusts of wind. In this process, air near the ground is slowed down by friction and consequently overtaken by overlying air masses. Waves breaking at sea shores can be ascribed to the same mechanism. Gusts of wind are therefore simply the effect of a vertical, rolling motion of air masses. 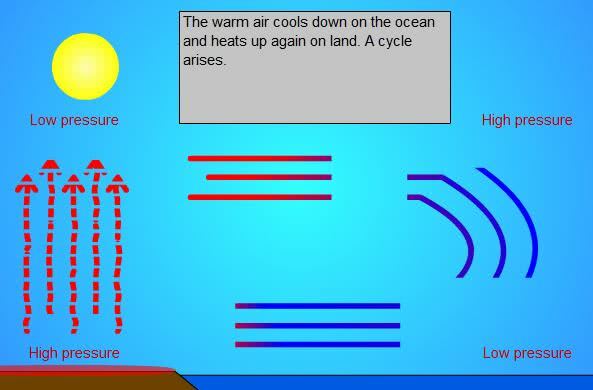 Variations in temperature at the earth’s surface give rise to air currents, or wind. Like water, the wind’s kinetic energy is a clean and inexhaustible source of power. However, the means of utilizing this source are technically limited: Winds blow irregularly and unevenly, and can produce highly destructive forces. 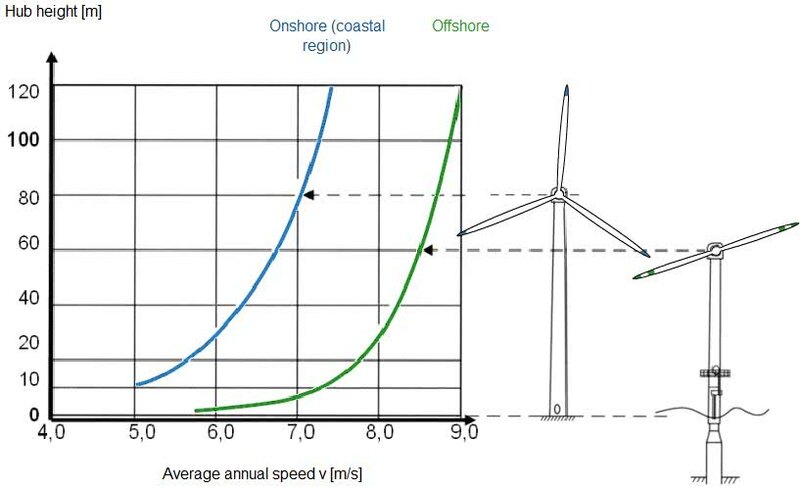 The chart indicates that the average annual speed vm is higher over sea than over land, despite the low hub height. This is because the surface of the sea is generally less rough compared with land, i.e. wind does not have to overcome as much friction at sea. Every country has its own typical wind profile. Plotting Germany’s wind profile over a vertical section, i.e. from north to south, results in the illustrated average wind speeds as a function of height. Wind speed increases with altitude, and so does the continuity of wind flow. However, the wind flow is very rarely perfectly even; due to ground roughness and vertical variations in air temperature, the wind tends to blow in gusts of varying intensity. 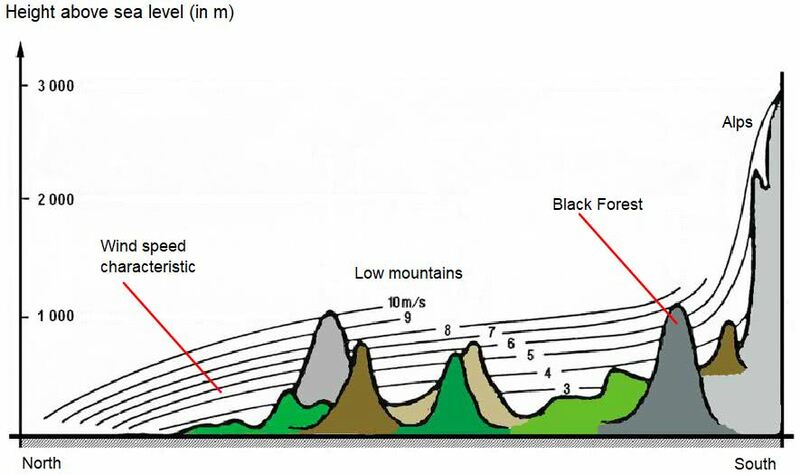 The influence of ground roughness on wind speed is illustrated below using Germany as an example. Here, the north is relatively flat, some low mountains reaching an altitude of about 1000 m emerging further south. The deep south of Germany gives rise to the Alps with their much higher mountains. Because wind speed is an essential variable during the operation of a wind power plant, each one is furnished with appropriate measurement equipment usually mounted on the machine housing. The sensor usually comprises a cup anemometer (derived from the Greek term anemo = wind) or ultrasonic device, the latter of which has a wear-free design and is likely to supersede cup anemometers in the course of time. 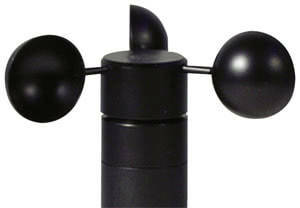 As practiced commonly in other areas of technology, the wind speed is indicated in metres per second (m/s). By means of appropriate factors, this unit can then be converted easily into km/h or knots. In meteorology (during weather reports, for instance), wind speeds are often specified in terms of the Beaufort scale, created by the English admiral Sir Francis Beaufort in 1806. The table below indicates conversions between the Beaufort scale and modern wind speed. We hope you’ve liked this article on various wind conditions and characteristics necessary for wind energy to solar energy conversion. 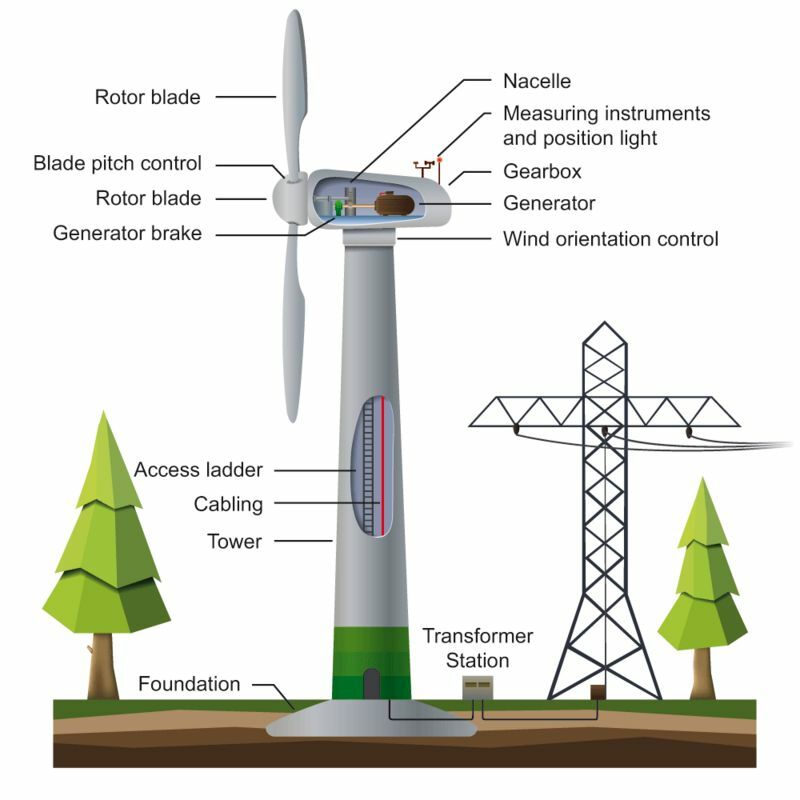 In this course, you’ll find more about the basic functioning of a wind turbine and how they convert wind energy into electric energy. There are other energy resources that have been discussed in detail. Continue this course on wind power plants to learn more. You may also want to read the History of Wind Turbine and working of horizontal wind power plants.